Vowed to love each other ’til d***h do them part, couple Floyd and Violet Hartwig who died just five hours apart have lived with their promise up to their dying day. The couple who both grew up in Easton, California finally “bade goodbye” on February 11 with Floyd leaving ahead and shortly followed by Violet. Floyd died at age 90 battling against colon and bladder cancer while Violet, 89, suffered from dementia and strokes. The children have sensed that their parents were close to d***h prompting them to push their parents’ two hospice beds together after which they have placed their father’s hand into their mother’s palm until both peacefully slipped away. While it saddens the family to have both parents d*e at almost the same time, daughter Donna Scharton told The Fresno Bee that they still felt blessed because they knew that was how the couples have wanted it to be. It was the only way it could end and it was meant to be, Scharton further disclosed. The Hartwigs first met in elementary school, but just like most love stories, it blossomed into a beautiful relationship. 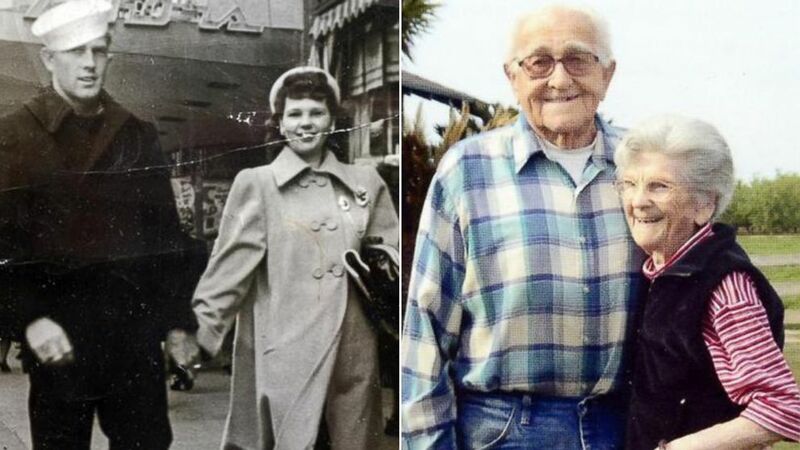 Floyd, who was on leave from the U.S Navy during the World War II in the 1940’s started dating Violet and they later tied the knot in August 1947. Despite distance, Floyd has always made Violet felt loved by showering her with love and affection through love letters which the family still has, 131 of it, in their possession. The following year, Floyd returned from duty and the couple lived to farm the 20-acre Easton ranch. Blessed with three siblings, namely: Donna, Carol and Kenneth, Floyd and Violet chopped cotton and fed turkeys. Floyd likewise labored as egg deliveryman and at the same time, foreman of a large Fresno County farm. According to reports, Floyd and Violet have four grandchildren and ten great– grandchildren. Meanwhile, Letson described her grandparents’ marriage as an example of perfect marriage especially in this era where there are many broken marriages. She further revealed that marriage is indeed forever. Floyd and Violet have not lost the “magic” of their love as it was 67 years ago and even up to their last breath.